When I first contemplated buying my Nintendo Wii, I was excited about the new set of controls and the fact that I could use the Wiimote as a sword, so when I first saw the trailer for the first Red Steel I was completely sold on the Nintendo Wii. Unfortunately, the first game wasn’t as good as you would have expected it to be. The pointer was jumping all over the place; the sword fighting was very basic and got to a point where I just didn’t want to swing the Wiimote anymore. Everything I was excited about before I played the first game was a let down. I did, however, play the game to the very end as it was something that was completely new and, at the time, was one of the first games I had played on the Wii. Had I reviewed the game at the time, I would have given it a two out of five. Although it wasn’t completely awful, it was still quite a big let down. 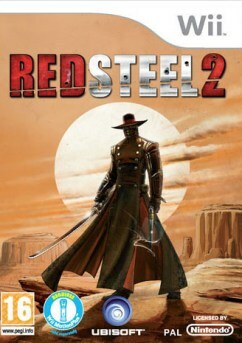 The new game, Red Steel 2, has completely departed from the original storyline, but has kept the same theme of a first person shooter with a sword. You play as an unnamed hero in an east meets west world. 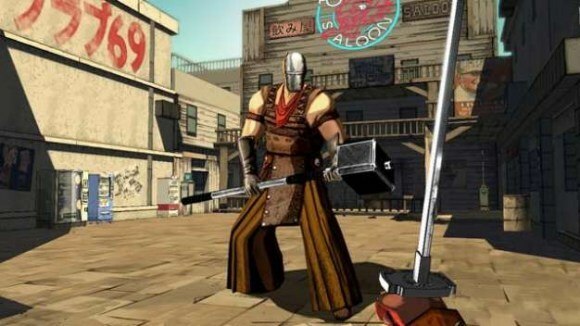 It is really interesting to see how the developers have mixed elements of the wild west with futuristic elements under a Kung Fu movie themed world. Even though this sounds a bit much before you even see the actual game itself, if you do buy and play the game you’ll realise that this original idea works. The game looks like something that should have been on the HD consoles. The folks at Ubisoft have really listened to the fans with this game and have brought back exactly what gamers thought the first one should have been like, but a whole lot better. 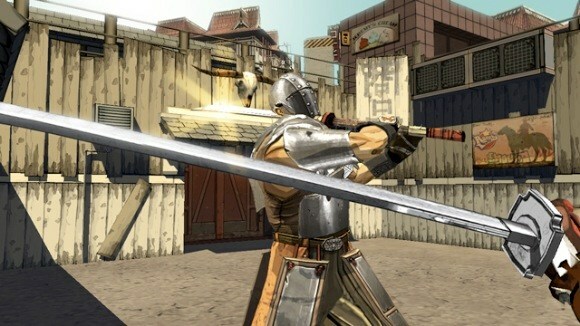 To put it simply, Red steel 2 sword fighting controls brilliantly thanks to the game being Wii Motion Plus only. It’s what sets this game apart from just about any game available right now. The sword fighting is split up into two segments. The first is normal sword swiping, which works very accurately. You have complete control of the sword when you swing the Wiimote in any direction. Your character will replicate whatever you do on screen. You can swing harder to get a more powerful attack and also stab by thrusting forwards. The second segment is the finisher – gestures based attacks. For instance a character will be on the floor and a little on screen icon of a Wii mote will show a downwards gesture. After swinging the Wiimote down, your character will perform a finisher, which usually looks like something out of a Kung Fu movie. Throughout these battles you can bring out your gun at anytime to shoot enemies at a distance, or even use the gun at close range as a finisher. One of my personal favourites is holding a gun under an enemies chin and pulling the trigger. As you progress through the game you are granted special abilities which are earned or unlocked. Some of these abilities become really useful as the game becomes more challenging in typical fashion. My favourite ability was being able to knock your opponent into the air and jump after him, causing everything to go into slow-motion and allowing you to chain a series of swords attacks. Another ability I found myself using was the ability to knock bullets back at enemies with the sword. This became very handy towards the end of the game. Now unfortunately I feel Red Steel 2 has had some unfair criticism. I went back to Red Steel 2 after reading some comments from other reviewers on the internet. Some claim it’s another waggle game, which I have tried and tested, only to find that your character looks left and right really fast when you try to waggle. Another reviewer said the game has a lag issue with the Wiimote, which again I tried and have yet to encounter. It saddens me to see somebody who owns a games collection including the likes of Call of Duty 4: Modern Warfare, Call of Duty: World at War, MAG, Modern Warfare 2 and Battlefield, but still be totally convinced that they are having a completely different gaming experience and yet at the same time will disregard Red Steel 2, because its either on the Wii or it’s not a war game. My personal question is would this game have been more successful had it been a gritty war theme rather than a stylish East meets West theme. What if everything about the game play was the same, but the guns were more war based guns and the sword was replaced with something like a bayonet? Would this be more appealing to gamers? I am sure you get the picture. Or would this game have been more successful if the whole game played on a regular pad? There is no other game like Red Steel 2, Ubisoft have taken an FPS game to a different level. This game is completely new, technically amazing, graphically brilliant and plays like you expect it to be played, unlike the first Red Steel. If you want something completely new, I couldn’t recommend this game enough as I really enjoyed this game. The only reason I won’t be given it a 5 out of 5 is simply because I personally feel that a FPS has to have Multiplayer. Go buy this game. I graduated from Bradford University in 2006 training in Animation and special effects. I have a massive love for animation and especially in games. I currently train with AnimationMentor, the Animators from Pixar and Disney. I also train as a martial artist, Tang so do, Tai chi and Capoeria, which is probably why most of my interest in films and games are usually action and fighting related. I really enjoy Manga movies (such as Fist of the North Star) and action movies such as Equilibrium, Matrix Trilogy, Blade, Night Watch, Drive, Hitman, Troy and Underworld. I’m also a big fan of psychological films such as Memento and Irreversible too. I have been playing games since I was little, first ever games console was a Super Nintendo with Street Fighter 2. Since then I have been completely loyal to Nintendo and have owned every Nintendo console, including the rare Nintendo watch, to date. My main interests are action games such as Smash Bros, Tekken and Mario Kart, however I do also like games which lean more towards good storylines such as Metal Gear Solid.